As most of you know, the film “To Be” is in script form and we are planning to make the movie. I’ve been in contact with a couple people who have experience in getting independent projects off the ground. Recently, one of those individuals had this to say about the film. It would help a lot right now if you would watch the videos, rate them, comment on them and share them with others. I am very excited about this new opportunity and I hope you will be as well. If you would like to help in with a donation of any amount, we will start shooting as soon as we know we can afford to make the movie. Another dark fairy tail from the man who created “A Nightmare Before Christmas.” Extremely stylistic characters, all with a Gothic cartoon edge, play out a tail of love life and death. The Van Dort family has a plan to marry there son into a rich family to raise there status. The Everglot family have been pretending to be rich even though they have lost there fortune. They plan to marry there daughter to anyone in an attempt to create another family to support their own. Victor Van Dort (Johnny Depp) and Victoria Everglot (Emily Watson) become the unwitting pawns in this Jane Austin-Esq social experiment which is simply the “Sub Plot”! Learning that you have to be careful with such declarations, the corps of Emily (Helena Bonham Carter) takes shape. With the ring on her finger and her dress in place (though showing a bit more of her decomposing ribs than she had once intended) Emily gratefully accepts Victor’s offer. Now stuck between two women and two worlds Victor’s world becomes much more complicated, and a lot weirder. Now the animation in “A Nightmare Before Christmas” was stunning. Not only is the look of the whole thing macob ly beautiful, the technical advances are huge. To do a camera move in stop frame is near impossible. With that being said… “Corpse Bride” improves on “Nightmare“s stylistic and technical brilliance at least 10 fold. Even the difference in the color schemes between the two worlds is amazing. 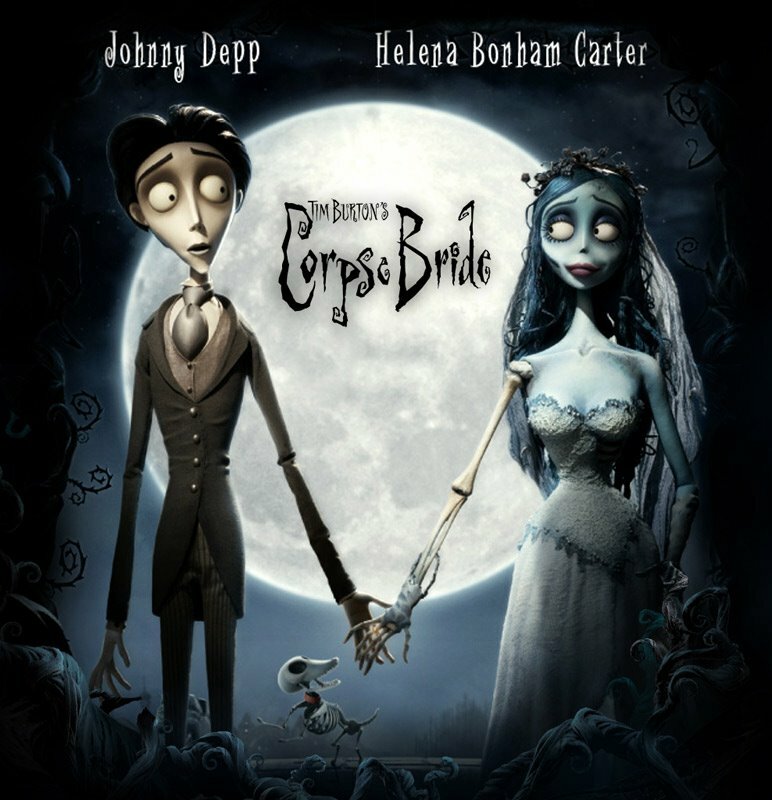 Not only that but “Corpse Bride” adds elements totally alien to “Nightmare” like a plot that makes it all the way to the end and, while we are there, an ending that actually makes sense. Though, with some characters you are supposed to see what is coming, I did not know which bride or state of being Victor would have been linked to until it was revealed. This would depend on your kids. Like I said this may be advertised to kids but it was made of teens. I would think lots of children would be disturbed by the constant jump scenes and dead creatures showing off there demise. (There is a man who we realize was cut in half, the long way, when he splits reveling all his organs.) Many characters have knives and swards still in them, and disembodied limbs and eyes are not uncommon. You can check Screenit.com for a complete break down of what is on the screen. Still even if you child can handle such visuals with out nightmares or dark obsessions, The spiritual content is still worth considering. First of all this wedding party gets many points right. There is a desire among the adult children to honer there parents even though there parents have poor motives. Love and Marriage are held up as good things. (Slight Spoiler) Victor even offers to give up what he actually wants to keep a promise! Though all that would be enough to be leery of, Burton throws in one of his favorite archetypes… the evil Christian. There are 4 major baddies in this film. Not the least of them is Pastor Galswells. He is first seen being just horrible to the like-able Victor. Later when Victoria discovers the state of things, she goes to the pastor for council. He tells her he can help, then forcibly delivered her to her family telling them to keep her locked up. Finlay (spoiler) when the Pastor is faced with an assemblage of the dead coming to his church, The Pastor commands “Back, ye demons from Hell!” but is quickly proven powerless as the ghost pass him by simply commenting “Keep it down, will yer? We’re in a church.” So, Pastor’s are here shown as mean, creepy, incorrect, and spirituality impotent. Once again, Burton holds forth lofty ideals of love, honesty, chivalry, and self sacrifice, but then denies the power to actually do any of it. In this case I think it would be wise to head the advise of 2 Timothy 3:5. I would steer your children in another direction. Unless they at the point intellectually to be able to separate the thrill of the art from it’s message, so that the movie could be used as a spring board for understanding opposing views and prejudices against Christians as well as there ideas… I don’t see any value in exposing some one to this film. You are much better off with the family friendlier Charlie and the Chocolate Factory. Where Burton, Depp, Lee, and Bonham Carter all stick to ideals that we agree on with out inserting the “evil Christian” character to muddy the waters. You are currently browsing the archives for the Black/Dark category.